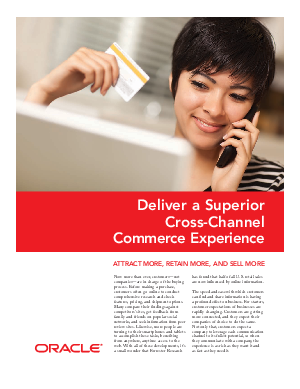 > Research Library > Oracle Global Marketing > Deliver a superior cross-channel commerce experience: attract more, retain more, and sell more. With the right intelligence and personal information, there are plenty of new opportunities for organizations to provide superior experience and maximize the opportunity of every customer touch point. This paper shares actionable strategies needed to deliver personalized and relevant content, based on a variety of factors, to truly deliver a superior cross-channel commerce experience.